Over the last 29 years I’ve read many books and magazines on dog training and dog behavior. 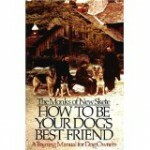 One of the earlier books I read (other than dog training manuals) is “The Monks Of New Skete”. It was the must read book in its day. If you read it today, you could still pick up some helpful advice, but because of the changes in technique and philosophies over the years, it’s not my first choice as a must read book for today’s dog owner. I know that dog owners are just expected to know everything about their dog, but the reality is- they don’t, and in many cases, not even close. As your dog’s teacher, your dog deserves for you to learn from the real Authorities in the business. A great way to do this is to read books that myself and other top trainers and behaviorists recommend. Books also make a great gift idea. Don’t Shoot the Dog, by Karen Pryor is a must read on my list! Temple Grandin’s latest book, Animal’s Make Us Human is also a good read. Only one chapter is on dogs, but the chapters on other species are very enlightening as well. Temple Grandin is very good about making the reader start considering the animal’s perspective. I enjoy really Patricia McConnell as well. Many trainers that have read Karen Pryor’s book, “Don’t shoot the dog” agree she is brilliant. but I have to admit, I’ve never read it. I know that she is the clicker training guru. I myself have been clicker training animals for about 23 years (maybe that’s why?). Its my understanding, from what little I’ve read of hers- our styles are just a little different. I guess I wont know 100% until I read her books. Thanks so much for the feedback and I’ll look into the other book you mentioned. My fave: When Pigs Fly: Training Success With Impossible Dogs, by Jane Killion. Despite the name, it’s not just for people with difficult-to-train dogs or breeds. My ACD is incredibly smart and motivated, but I still loved this book. I think it’s a great resource for the new OR experienced clicker trainer. That is one I’ve never heard of. I know there is more than one book on clicker training, but if I knew it was going to be this popular, I would have written my own book on the subject 22 years ago. I’m curious if Jane Killion has the same style as Karen’s style, which I’m not totally in agreement with. Why? I’m not a fan of what I call “Out of the blue” clicking, i.e. using the clicker for things a dog is just doing on their own. Even marine animal trainers give visual or sound cues that represent the start of a training session, just as we did training the animal actors. To me, “Out of the blue” clicking a dog, is like your kid walking into the room and you say, “here’s a dollar”, then they sit down and you say “here’s a dollar” they put their hand to their mouth and you say “here’s a dollar”. Sure, this may keep your kid inside instead of outside getting into trouble, but it’s guaranteed to make them a little neurotic when they’re around you. I’ll be explaining in more detail in a future blog and video on how I clicker train. In the meantime, thanks Dawn for the book recommendation. It’s good for my readers to learn from many different sources. You’ve been clicker training but have never read Karen Pryor? That is surprising. Ian Dunbar isn’t a clicker trainer. Who taught you how to build a cue? 22 years ago I learned from and worked 1 year with studio animal trainer, Dawn Martin, who, lucky for me got married and moved to Canada to train animal actors up there. That put me second to the owner (Rob Bloch) and for the next 3 years I kept really busy. Hi again, Robert. Yes, the book I suggested does describe clicker training using the same kind of method as Karen Pryor — shaping the behavior and then adding the “cue.” I’m no expert (I’m not a professional trainer at all, I just love clicker training my own dog), but to me, what seems to work so well about it is that it engages the dog in “problem solving.” It’s like that game that we (or at least I, LOL) used to play when we were kids — something’s hidden in the room and you tell the person, “you’re getting warmer; you’re getting warmer…” until they find it. Hopefully this makes sense — I’m not even sure if I answered your question! It makes perfect sense, Thanks for that. It sounds like fun, It definitely goes beyond what I generally do and I can see where it takes more time and dedication. Mental exercise is very tiring to dogs and the Karen Pryor method would really tire them out. “Full on” clicker training is just another way to have fun with our dogs, keep them active and at the same time they learns things, Cool! I’m curious what the most un-usual behavior you’ve taught using that method? Robert, I’m still pretty much a beginner, so I haven’t really taught anything too unusual yet. My favorite behavior we’ve accomplished is “clean up,” where he picks up all of his toys and puts them away in a basket! If only my kids would listen as well when I ask them to clean up THEIR toys! Thanks for the comment and the good book suggestions. I have both of those, definitely a must for dog professionals. Hi Hans…Those are Awesome! Thanks for your 2 cents!